Whew! That 6 hour flight from Newark to Washington is extremely long and cramped. It’s amazing how you can leave at 7:30 am and still be in Seattle before noon! I got myself through the baggage claim and rental car with minimum of fuss and headed off toward Tacoma, lunch, and Port Defiance State Park. 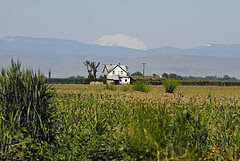 The day was crystal clear, and Mount Rainier loomed fantastically on the horizon as I drove south. I love a place with snow-capped mountains, and I was already loving Washington! I grabbed some lunch – even though my East Coast body insisted it was an afternoon snack, and headed to the park, of which I had heard great things. For a wonder, the guide books had not exaggerated. Port Defiance in springtime was full of miniature wild daisies in the grass, showy rhododendrons, pebble beaches full of driftwood overlooking the Puget Sound, Japanese and Rose Gardens, a Zoo, and Fort Nisqually. 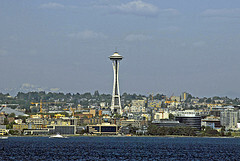 Being a folklorist and amateur historian by trade, it was the Fort that drew me to Tacoma on my first day in Washington. It was a Hudson’s Bay Trading post back in the 1850s, when people would walk 70 miles in 3 ½ days in order to visit the “store”! Wow. You don’t want to make that kind of trip more than once or twice a year. When I entered the trading post building, the storekeeper instantly asked me what I had to trade, opening up a conversation that ranged from beaver pelts (versus the rental car – which I was sure would bring me more options, but he feigned ignorance of the modern automobile) to whiskey so watered down (Going for $10 a cup in 1850, mind you!) that a New York or Chicago resident could drink it like water all day without getting tipsy but it would get a trapper fresh from the mountains after a 3-year stint in the back of beyond roaring drunk. After visiting 1850 for an hour, I napped among the daisies in the park, and then took the scenic 5-mile drive through the park with amazing views of the Puget Sound and the Olympic Mountains before heading to my hotel for dinner, a soak in the hot tub, and bed. Tomorrow – Mount Saint Helens! I drove to Mt. St. Helens today after breakfast. It was a spectacularly sunny, clear day. You could see the mountain with the gaping hole in its side as soon as you got off the highway, looming mysteriously over the landscape. A few miles down, Mt. Adams became visible for a few minutes, and it was amazing to see two snow-covered behemoths towering above the farmland. I stopped to take pictures of the mountain at the Visitor’s Center, and then paused at the edge of the blast zone 14 miles out from the peak. You could see the change in the landscape – smaller trees, not so lush. As I drew closer and closer to the mountain, the trees got smaller and smaller, the shrubbery wiry and low to the ground. This was not a happy ecology. At Coldwater Lake, the water was teal with glacial silt, and the signs told visitors not to pick up any ash. Yes, there were still ash deposits clearly visible almost 30 years after the blast. As I ascended the final ridge before the massive peak, a shocking change occurred. Until then, there was greenery everywhere. Admittedly, the trees were small and rather stubby looking, but they were there. But now, they weren’t there. Instead, there was rubble, and the gray trunks of many trees smashed to the ground by the blast. And as the rental SUV climbed higher, there were stumps of trees that had been sheered off at ground-level, their massive trunks turned instantly into sharp splinters in the force of the initial blast, adding their wooden debris to the superheated steam pouring forth from the volcano. In all, more than 230 square miles of forest were destroy by the eruption. When I reached Johnston’s Ridge, I looked down into a deep valley before the heart of the volcano, and saw complete devastation. Huge hummocks of rock littered one side of the valley from the landslide that triggered the explosion. One part of the ridge was sheered off at the top by the larges landslide in recorded history. The top of the mountain disintegrated during an earthquake, and the landslide buried the valley and kept right on going over the section of Johnston’s ridge that was right in front of it and into the valley on the other side. Part of the landslide was deflected by the taller sections of the ridge and poured instead down the river valley. In a matter of minutes, the river that once filled the valley below the peak was gone – buried so deep it would never run again. These days, a much smaller melt-water river cuts through the ash and rubble deposited in the valley, snaking its way downward from the glaciers of the peak. One fact I found completely amazing was that the explosion triggered by the massive landslide actually outpaced the landslide. The landslide was clocking in at more than 100 mph, and the explosion that followed it was over 300 mph. So it ran right over and past the landslide, exploding trees in the near vicinity, knocking them flat on the further ridges, and burning the forest where it stood a few miles out. When the slower landslide hit the ridge and filled the surrounding valleys, it pushed Spirit Lake 800 feet up the side of the mountain, where the water picked up all the flattened trees and washed them back down into the rubble-strewn lake bed. The heat melted the glaciers, of course, and so mudslides began pouring down from the volcano, which was also emitting a large column of ash. All in all, it was quite a show. Even after the violent eruption in 1980, the volcano remained active, pouring out a slow-moving lava which eventually formed a new cone in the center of the caldera, and evidencing other volcanic activity well into the next century. All in all, it was a wonderful, informative day, and I was so exhausted by the end of my volcano visit that I fell into bed right after supper! I headed out for Mt. Rainier right after calling to wish my sister a happy birthday. I was driving over the Cascades today to Yakima, and wanted to take my time and enjoy the trip. The scenery was spectacular as I drove through a long farm-strewn valley surrounded by huge mountain peaks, with occasional glimpses of Mt. Rainier in the background. I paused at least once to photograph a field filled with yellow flowers with several horses grazing amidst them. Lovely! I also passed through the Memorial Weekend Fair in the tiny town of Packwood. It was packed with people and salesman and food vendors. A great time was being had by all, but I had other plans for the day, and didn’t stop. I entered the National Park and headed up to the turn-off for Paradise, my goal for the day. And was stopped by a fence across the road. A ranger stationed by the road block told me that a huge avalanche had buried the road further up, and the road would not be clear until August! Can you believe it would take so long? Wow! Apparently, it was a very hard winter on Mt. Rainier. So, with Paradise Lost to me – at least on this trip – I turned my attention elsewhere. I pulled into a parking lot and followed the next item on my agenda – a hike to the Grove of the Patriarchs. This was a lovely hike following the river to an old-grove of 500 to 1000 year old Douglas Firs. It was mostly snow-covered still, and I reveled in hiking through snow in 70 plus degree weather. Very cool. The path veered down to the river, and to a narrow hanging bridge with a sign stating that only one person could cross at a time. It looked sturdy to me, but I obediently fell into line behind another family, and was glad I did. The bridge rocked and swayed under my feet, always moving in a direction I had not anticipated, which made walking tricky. Then I was onto a snow-covered island among giant trees. And within moments, the nice boardwalk path splintered and disappeared under the weight of a fallen Patriarch. Now I could see just how hard the winter had been on Mt. Rainier. There were fallen trees and fallen branches everywhere, blocking the path in several places. Pine cones and pine needles blanketed the snow-covered pathways. In a few places, the warm temperatures had triumphed and you could see the wooden walkway. In others, I had to thread my way through fallen branches, ducking under the taller and vaulting over the low-lying specimens. Still, it was worth all the work to find myself standing below twin 1000 year old Douglas Firs, which were – as a fellow hiker reminded me – Nearly 500 years old when Columbus sailed the ocean blue. Following my trip to the Grove, I drove up and over the pass through towering snow banks. I paused a few times to climb 20 foot drifts and take pictures of the amazing views at the top of the mountain. Then I drove down the eastern slope, taking note of the dramatic change in the scenery as I moved into the rain shadow of the Cascades. I stopped for some R&R at Bumping Lake, enjoying the sunlight sparkling on the water and the view of the snow-capped mountains surrounding it. Then I drove through a river valley filled with rocky canyons and into the rolling mountains and sage-brush of the desert lands leading into Yakima. The colors and shapes of the high-desert hills were amazing, and I smiled to see all the sage brush dotting the landscape. I had reached the Wild West of Louis L’Amour fame. Yeehaw! 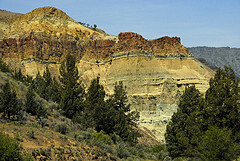 Tomorrow, I head south to Oregon and the John Day Fossil Beds. 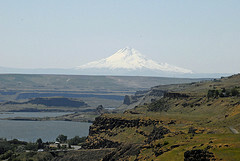 The road led south this morning through the Yakama reservation, and I found my gaze caught by the massive shape of Mt. Adams on the horizon. According to legend, three of the mountains in the Cascade Range were originally members of the clan of giants who lived before recorded time. Mt. Adams and Mt. Hood were brothers who were both in love with a fair maiden, and who fought over her until the earth rumbled, shook and spouted fire. The force of their battling was so great it overwhelmed the lovely maiden. Dying, she collapsed bleeding to the ground and the younger brother fell to his knees beside her in remorse. But the elder brother stood looking down upon them in pride and rage. It was thus that the angry Great Spirit found the trio. As punishment for their warring, he transformed the elder brother – who stood tall and proud and aloof – into Mt. Hood, who still stands aloof on the far side of the Columbia River and gazes from afar on the object of his desire. The younger brother, who knelt in sorrow and agony over his beloved, the Great Spirit transformed into Mt. Adams, and beside him he tenderly placed the stricken maiden who became Mt. St. Helens, the loveliest mountain in the Cascades (until she blew her top in 1980, but that is another story). I passed a number of huckleberry and fruit farms as I entered the reservation, and the sight of all those wonderful cultivated fields with Mt. Adams above them made my photography sense twitch in anticipation. When I saw the local museum, I paused to learn more about the Yakama tribe and take some photos at the RV park next door. As always in these spooky trips, it is often the serendipitous that delights more than the planned activities. The tiny museum was delightfully full of wisdom. A wonderful mural of the animals living on or about Yakama land had been painted on one wall. It showed how the Yakama used nature to teach life lessons to their children: “The otter takes time to play. The lesson is – a light heart keeps everything in proportion.” I liked it so much I asked about it at the desk and found they had made a children’s book about it, which I purchased. After my museum visit, I drove up through the foothills of the Cascades and down to the Columbia gorge, over which presided elder brother Mt. Hood. My destination was Maryhill and the replica of Stonehenge created by her owner. To my delight, the new Stonehenge stood on a bluff above the gorge, and the scene of the bridge over the Columbia and Mt. Hood was spectacular. Out came the camera, of course, and I had to force myself away from the scenery to explore the replica Stonehenge, which was itself fascinating. Then I was across the bridge and entering Oregon. It is so different from Washington, and yet there is enough similarity to let you know the states are sisters. I wound my way through desert hills and passed farmland over which elder brother kept watch on this side of the bridge. Then I was winding downward on a road which had obviously been constructed by a rattlesnake with a twist in its rattle, coming off the tall plateau and down into the hills and valleys surrounding the John Day River. And there, in the middle of nowhere amidst spectacular scenery, was the Clarno Unit of the John Day Fossil Beds. I’d arrived! 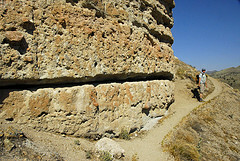 The Palisades – huge upthrustings of rock that loomed over the valley below – were magnificent, and full of fossils. I hiked with a nice couple right up to the rim of the massive rocks over foot-wide dirt and gravel pathways with stunning (and terrifying) drops down the hillside, should I happen to slip and fall. My knees shook over the worst bits, and I was glad to obtain the safety of the cliff face and take photos of the beautiful view and the fossils we found there. Back at ground level, I took a trail through the massive boulders that had fallen from the Palisades, and found many more fossils to admire – leaves and branches captured in stone after an ancient flood. The road to my hotel led through still more spectacular scenery, over tall desert mountains and down into the river valley again. I stayed in an historic hotel in the tiny town of Mitchell (one main road – very short). The one town restaurant was already closed, so I got a soda at the dusty but well stocked general store, had a chat with the folks staffing the register about the ghost of Patty, a local girl who’d been killed by her mother (methods and reason behind the killing unknown) and who haunted all the local buildings, knocking items off shelves, playing havoc with the lights, etc. Then I purchased a frozen dinner from the desk staff of the hotel, who had a handy list of items for sale – just in case visitors came late to their doors – and ate on the front porch overlooking the stream. All in all, a nice day! I was up around 5 am this morning, too excited to sleep. If at all possible, I wanted to photograph the sun rising over the Painted Hills. I grabbed a muffin from the breakfast tray downstairs and was on the road by 5: 45. Within five minutes, I was at the turn-off for the Painted Hills unit of the John Day Fossil Beds and catching glimpses of bluffs and cliffs of red and gold here and there as I drove the dust road toward the main fossil bed. The sun was already gilding the tops of the mountains around me, and to my chagrin, I could see three other photographers had already staked out places on the overlook as I drove up the windy dirt road. The main set of hills – the ones most photographed – were still in shadow, I was relieved to note. But the golden sunrise was creating a beautiful scene on some of the higher elevations. I parked my car in the gravel turn-off, grabbed my camera, and went to work. After a blissful hour of shooting in the increasing daylight while I hiked the one-mile path to the overlook point and back and chatted to my fellow insane-enthusiasts, I jumped into the car and drove to the other hiking trails I’d missed in my first visit last year. One trail led past Turtle hill, which was full of fossils. 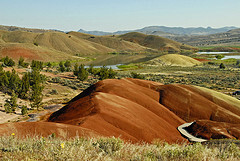 The other took me right up to (and through) the red clay stone hills to a bluff overlooking both Painted Hills and a small lake. Gorgeous. A final path led to a bench partway up a nearby mountain, with breathtaking views of the valley. The path was steep and narrow, but after hiking the Clarno Unit the day before, I was more than ready for it. I didn’t expect to be accompanied by four partridges, who scolded and chased on another around and up the hill. It was only 9:30 am when I reluctantly left the Painted Hills in search of some breakfast, since the muffin and the power bar I’d eaten were wearing off. Unfortunately, I reached the Sheep Rock Unit of the John Day Fossil Beds before I reached a town. So I ate the final power bar, refilled my water bottles, and hiked into the Blue Basin. Several folks were hiking out of the Basin as I hiked in, but they were the only people I saw for nearly an hour. The sun was hot, there was no shade even from the cliffs of blue-green claystone, and the streambed that the trail followed had long ago dried in the desert heat. But I was prepared, and sipped carefully at my water as I walked through the incredibly gorgeous blue-green cliffs of the basin, stopping to admire fossils of bones, a turtle shell, and others along the way. Thankfully, no rattlers appeared along the trail, which was baking in the heat. My path next led to the Overlooks where I’d stopped last year – Cathedral Rock, the fire cliffs, the blue butte (a 24 by 16 inch copy of which adorns the walls of my bedroom.) In someway, it was like coming home to return to this beautiful place nearly a year to the hour in which I viewed the previously. By 1 pm, I was done and nearly out of gas. The SUV and I limped into Dayville to gas up, and got a recommendation from the lady at the pump for a nice restaurant 25 miles further on. Yep – I told you it was remote!! I staggered in, a pitiful, starving, sunburnt mad-woman who’d taken more than 2000 fabulous photos in 8 hours. They fed me up on a hot turkey sandwich swimming with gravy (my favorite) and waved me on my way over the hills to Pendleton, where I turned in early – aching but satisfied by my lovely day! It quickly became obvious to me in the morning that this had to be a “putter around” day, after the strenuous activities of the previous day. So I had a leisurely breakfast, packed up my things and drove slowly up to Walla Walla, where I puttered in the local Fort Walla Walla museum, which was full of visiting students on a day trip (120 of them). 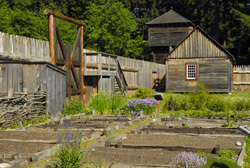 The fort had displays on the local industry over time – farming mostly – and a replica village of buildings as they would have appeared after the valley was settled by folks traveling the Oregon Trail. Fascinating. My second stop of the day was the Whitman Mission on the far side of town. 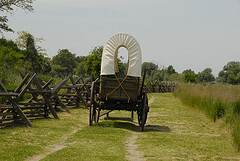 These missionaries had traveled to this location before the settlers began their trek on the Oregon Trail, and they worked hard to establish a mission in this harsh territory, helping the tribes people with medical difficulties, comforting the first settlers of the Oregon Trail, and adopting a family of seven children after their parents were killed during the journey to Oregon territory. Sadly, due to a misunderstanding between cultures, the family and many of the people living at the mission were wiped out by an attack by the Cayuse people. Oddly enough, one of the reasons the US government was so swift to name Oregon a territory was to give them the excuse they needed to track down their killers. In the afternoon, I drove up to Palouse Falls through some amazingly picturesque farmland. The road wound up and down rolling hills, and farms were tucked away in secret, hidden valleys that opened up suddenly after a bend in the road. Just lovely. The falls themselves were tucked away in a gorge in the middle of nowhere, and they were spectacular – plummeting to the floor of the gorge and out past incredible cliffs of basalt. A palisade of sharp pointed rocks that looked like a sharp fence stood right beside the falls on a little peninsula surround by water on one side and sheer cliff face on the other. 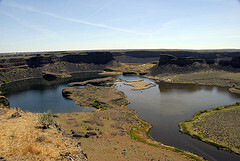 According to the information available at the site, the whole gorge – indeed, the whole territory through which I was traveling – which was known as the Palouse – was carved out by a huge flood when an ice dam broke during the last ice age. You could see where massive amounts of water had poured out from the dam and washed through the weakest places in the basalt to carve out huge cliffs, free-standing stones, and massive gorges like the one before me. 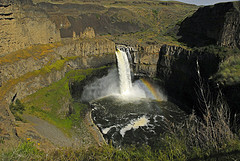 The river was already half-way down the cliff face when it plunged down in spectacular glory as the Palouse Falls. In the middle of the worst of the floods, the waters would have reached the top of the gorge where I was standing. Amazing! 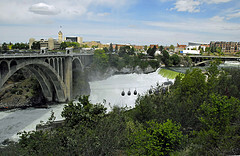 After having an early picnic supper, I headed up to Spokane where I checked into my hotel, drove through the city to get my bearings, and then had an early night. It’s nice to be spending two nights in the same location. It means a leisurely morning where I don’t have to pack up everything and depart at a certain time. After breakfast, I headed into downtown Spokane to wander through the Riverfront park where the (World’s Fair) took place. I chanced immediately upon a giant Radio Flyer wagon with a sliding board for the handle, and several classes of students shrieking and playing upon it, watched by their class parents. Several wooden blocks painted in fancy colors and letters where piled artfully around the grassy knoll where children could play upon them. Beyond the knoll was the river, peacefully full of ducks, geese, sea gulls, and sculpture. And towering over the scene was the clock tower that stood on a nearby island. I wandered over the bridge to examine the tower and the old Fair pavilion beyond it. Then I headed out toward Canada Island, hoping to see the totem pole that stood thereon. But I was sidetracked by the noise of white water, and went instead to the side of the bridge to see rapids that surely would have been classified as Level 5 on a white-water river. And they were running through the heart of a city!! Amazing. I’d heard Spokane had a falls in the park, but I hadn’t expected this. And it got better. The rapids plunged downward, around a huge sentinel rock, and the upper falls were split by Canada Island. As I watched, a rather stupid Canada goose got stuck in the rapidly flowing water and had to flap frantically for several seconds to get himself out of danger. I headed down to the lower bridge to take pictures of the falls from a different angle (and to snap a shot of the totem pole). And that’s when I realized that this was only the “upper falls”. Which meant… I turned around, and saw a suspiciously cut-off look to the water behind me! Ah ha! Perhaps it was time to take the sky-ride that advertised itself as going over the falls. Boy was I glad I did. The lower falls were even more spectacular than the upper, with a short and smooth upper drop followed by white water all the rest of the way down as the falls hit rocks and churned over rapids. A massive rainbow arched over the roaring mass of water, right underneath the Monroe Bridge. Gorgeous! 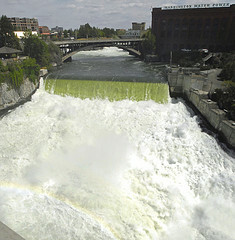 According to legend, Coyote created the Spokane falls after he sought to take a bride from the local tribe and his suit was rejected. In retaliation, the Trickster took some large rocks and threw them into the river, creating the falls, so that the salmon could no longer spawn all the way up to the village of the maiden who rejected him. I spend the afternoon hanging out by the pool and doing laundry, and in the evening went north to another local park along the river walk along the suspension bridge and admire the volcanic rock formations known as the bowl and pitcher. Then I found a great hole-in-the-wall diner with fabulous food known only to the locals and had a wonderful meal before coming back to the hotel to edit a manuscript and fall into bed. Another great day in Washington! I spent the day wandering through eastern Washington, admiring the farmlands of the Palouse and the sage-filled high desert region. My path led first to Dry Falls, which – during the ice age -- was three-times the size of present day Niagara Falls. Even dry, it was a massive sight – a huge gorge with small-looking lakes at the very bottom where the churn pools once lived. The Dry Falls were created by the breaking of the ice dam from the one-massive Lake Missoula, created when a glacier blocked the river and the water backed up for hundreds of miles into Montana and grew to a depth of 2000 feet! When the ice-dam broke, all that water poured out, emptying the lake in 48 hours and smashing through eastern Washington with such force that it carved up the landscape like a stream in flood, depositing massive boulders here and there, gouging out channels (like the Grand Coulee – which really was once filled to the brim with flood water), and falling over massive water falls like Dry Falls. It finally hit the Columbia Basin, where it gouged at the Columbia gorge and flooded the Willamette Valley on its way to the sea. Apparently, even the ocean bed of today still bears signs of the old-time ice-age floods. After lunch at a teeny restaurant in the small downtown, I drove up through the Grand Coulee toward the famous dam, and paused in wonder when I found Steamboat Rock State park. The huge monolith dominated the landscape, looming over a gorgeous lake. It was absolutely surrounded by golden wildflowers and purple sage, and I had to stop for a short hike amidst such beauty. At the top of the main trail were gorgeous views and a picnic table under a pine tree – a welcome spot to rest after the blazing desert heat. After checking into my hotel, I went for a drive through the Coville Indian Reservation, making my way up and across the mountains to the San Paloi river valley (lovely), where I had a picnic dinner at a park overlooking the river. Then I drove back across the mountains to the Columbia River valley (also lovely!) Entering the Columbian River Valley, I was once again struck by the landscape – an oversized dry river bed with the (at this giant’s scale) teeny tiny Columbia River way at the bottom. When you view the landscape as a giant river bed, you can see all the channels the flood cut, and the house-size rocks it through everywhere. I was in awe. Apparently, the best place to view the giant flood-path is from space!! After a relaxing drive, I spent some time examining the Grand Coulee Dam, which is the largest concrete dam in North America and the third largest producer of electricity in the world. Amazing engineering feat. It spans the Columbia river – the third largest river in the USA, an it generated more power than a million locomotive, which supplies electricity to 11 of the western states. Yet electricity was only a secondary purpose for the dam. It was originally created to help irrigate eastern Washington, where low rainfall was threatening the agriculture of the state. After a quick swim, I found a comfy chair and settled down to read and relax for the rest of the evening. Drove across the Cascades today, over Washington Pass on the Northern Cascades Highway. What a lovely trip! Fantastic vistas as I drove toward the Cascade range from eastern Washington. Then a quick stop in the Wild West town of Winthrop to get gas, visit the Sweet Shop, and grab a picnic lunch at the local deli. It looks like a fun town in which to stay on the next WA visit. After Winthrop, the road climbed and climbed, and glacier topped peaks appeared. Seemed every bend brought a new turnout on the side of the road for those with a photographic bent. I think I stopped at them all! Soon the glaciers were all around me as I crossed the pass. 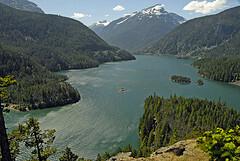 Then I was driving downward to Diablo Lake with its high winds and glittering glacier-fed waters. And further down to the Falls, where I took a hike to the dam and managed to give myself poison ivy. Yuck! Once I hit the western side of the Cascades, I found myself in farm country, with horses and cows browsing lazily amidst fields of yellow flowers. A photographer’s dream! But I finally did make it to Burlington, where I stopped for dinner and checked into my hotel. I would never have thought a day spent driving would be so relaxing!! 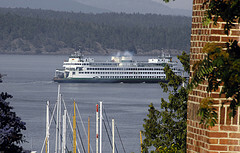 I caught the ferry this morning for San Juan island. For some reason, I was terribly nervous about the whole ferry traveling experience. I was packed the night before so I could rush out in the morning, and I fussed and fumed my way through the local traffic. Finally, I turned into the ferry landing, paid an outrageously high price for the privilege of traveling on the ferry, and got lined up. And suddenly it was easy! With time to spare, I got out of the car and photographed Mt. Baker over the Salish Sea. Then I put my car onto the ferry and took pictures of the mist slowly clearing over the archipelago. Lovely! Of course, all those nerves put me on such an early ferry that it was too early to check into my B&B. But the host family seemed nice online when I booked my reservation, so I dropped by and asked for some hints about how to spend my first day on the island. The owner not only recommended a great whale watching tour, but he also got me checked into my room and gave me some good ideas for a place to eat lunch. I spent a glorious afternoon on the water in a 32 foot craft with 13 other whale watchers plus the captain. We saw absolutely everything… except whales! Of course! Porpoises sported in our wake, bald eagles soared overhead, black-tailed deer swam across the channel with their antlers barely above water, a mink scampered along the rocks. But no I orcas! I snapped a huge number of photos, and by the time I hit the shore I was sunburnt right through my sun-screen, wind-blown and worn out!! I staggered across the street to the pub to get fish and chips, and then walked back to the B&B. I was out like a light by 7 pm!! Guess I got a little too much surf and sun! I met my fellow guests over a delicious homemade breakfast the next morning. Our host outdid himself with egg and cheese soufflé and homemade sourdough wheat bread. Yummy. I met a couple from Colorado celebrating their 30th anniversary. We hit it off immediately. He was a bird-watcher, she was an IT bigwig who spoke Web. We talked for nearly an hour before they went wandering and I headed off to investigate spooky spots and see if I could spot orcas at the only whale watching park in the USA. After spending an hour purusing sculpture at the local sculpture garden, I found myself in Roche Harbor with its haunted hotel, and talked ghosts with a local kayaking guide who sat at the next table at the local diner where I ordered a picnic lunch. He guided me to a creepy local mausoleum, which I promised to visit the next day. Then I went to visit the English camp, which was one of two historical parks on the island. Now, I’ve heard of exciting wars in my time, but this was the first time I’d heard of two nations going head to head over a pig. Yep, that’s right.. English camp on the north of the island and American camp on the south were there because of a pig. In the Pig War, a Hudson Bay employee shot a pig who had gotten into his vegetable patch. Apparently, the pig was a British citizen (okay, his owner was) and the resulting contretemps following the pig shooting brought both governments into the picture. They decided it was time once and for all to determine who actually owned Oregon territory. It took 10 years for a decision to come down from an outside (and supposedly impartial) source. 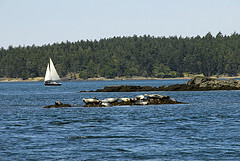 San Juan Island – and most of Oregon territory -- belonged to the USA. 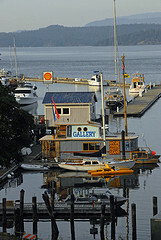 Vancouver Island belonged to England. And thus ended a ten-year war in which the only casualty was a pig. I spent a lovely few hours hiking in the whale watching park. Though no whales were spotted, I did discover a lighthouse and Deadman Cove. With a name like that, I was expecting a story of pirates. But the real story was just as interesting. Back in the days when smugglers brought illegal goods to the island from Canada, they also brought illegal immigrants. The local authorities delivered a slap on the wrist for contraband, but the took sterner measures when they found immigrants aboard ship. So some of the more unscrupulous captains dumped the immigrants overboard if they thought they were going to be boarded – regardless of whether or not they could swim. And where did the bodies usually wash up? You guessed it. 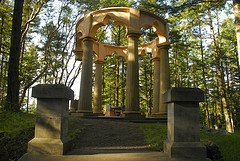 I finished up a day with a hike to the creepy mausoleum, which was way back in the woods by itself and was full of Masonic symbols and a round table with chairs at it – one chair for each member of the family (and the ashes of the family member buried under the chair) so that the family was once again united after death. I confess that the whole scene made me uneasy – though no ghosts appeared at the round table while I was present! Well, our B&B host produced another fine breakfast. At this rate, they will have to roll me home! It was the official anniversary day of the Colorado couple, and it was a real wrench to stop all the shop talk with Carol so her patient husband could carry her off to their anniversary activities. They did promise champagne on the deck after dinner, so I knew I’d see them again. I went to the whaling museum in the morning, and then got another ticket for whale watching, since I desperately wanted to see the orcas. It was a lovely big boat this time with two huge indoor cabins and really informative naturalists who told fantastic stories. We saw dozens of seals swimming in the sound, and a very drunken sea lion who the naturalists thought was probably dying from a certain type of seaweed that was poisoned with dumped chemicals (apparently, this has really been impacting the sea lions of late). And we saw one gray whale. I say we saw it. What I saw was a number of impressive looking spouts and a gray back. Fortunately, the boat ride alone was so beautiful and relaxing, and the sun was shining the harbor porpoises were playing around us, so I couldn’t imagine being anywhere else but on the water, with or without orcas. And I’m sure the gray whale was a very nice sort of person, and he certainly did have an impressive spout. I got dinner a the local dive adjacent to the bowling alley and stopped down at the harbor for ice cream. My Colorado friends found me eating Death by Chocolate on a bench overlook the ships and reminded me again about champagne on the deck. They were off to a fancy dinner, so I waved them goodbye, finished my ice cream, and went back to the B&B to look over my photos – something I always enjoy. When they got in, we drank champagne and swapped stories until late. Our B&B host finally shut off all the lights in and out of the house to encourage us to shut up and go to bed!! Travel, travel, travel. Drive, drive, drive. This ferry system is getting a bit old. I had to get my car in line by 9:30 for the 11 o’clock ferry. Then 90 minutes crossing. Then an hour drive down to the next ferry landing – with a short stop Deception Pass, a lovely place with a fantastic legend I want to use in Spooky Washington. Then wait-wait-waiting for another ferry. And a 45 minute crossing. 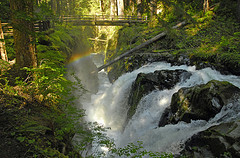 Then 2 more hours to Sol Duc – my final destination in the Olympic Peninsula. Fortunately for my patience, I had a great sci-fi novel to listen to, and once I hit the Peninsula, the views of snow-capped mountains and glittering lakes drove away my grumpy mood. Cap that off with my very own cabin at the end of the trail – a home away from home at last – and three natural hot springs in which to dip my aching bones, and I can say this day of travel ended well. Oh wow! What a lovely day. After breakfast, I went hiking in the rainforest, down to the Sol Duc falls. The Douglas firs around me towered up hundreds of feet and the circumference of some of the larger ones would have put an elephant to shame. Moss was draped everywhere! Simply festooning the fallen trees, the branches of the behemoths around me. Ferns were everywhere. AND I got to see it all in the dry! There was nary a cloud in sight! I don’t know how many times a rainbow could actually be spotted over a water fall in a rainforest, but I got some pictures of the one it sported on this lovely dry day. This is forest primeval I was walking through. Bears, cougars, birds and Bigfoot would all be at home in this place! Then I was headed away from the rain forest and down to the Pacific ocean. Of course, my path led me through Forks, Washington, and I had to stop there for an hour for the sake of my sister, who is absolutely crazy about the Twilight series. Yes, I saw the high school that Bella attended. And yes, I ate lunch at the Coffee House where she had some sort of meal with a chap named Charlie. I called my sister from the parking lot of the restaurant and listened to her exclaiming in exultant delight as I enumerated everything I had seen in Forks. I should be nominated for sister of the year – cause I even got her a Forks T-shirt. 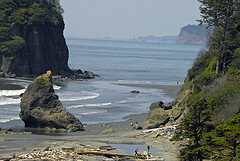 Finally, I made it to Ruby beach, where I strolled among the sea stacks, marveling at the ruggedness of the coast, the beauty of the Pacific Ocean. The tide was going out, so I took off my sneakers and walked among the breakers, looking at anemones and star fish and muscles. I crossed a stream babbling its way into the salty sea, and climbed up on huge bleached-white logs – old trunks of fallen Douglas firs and other massive rainforest giants. I spoke for a while with a couple from Holland who were traveling a month through the U.S. Their itinerary put mine to shame. I thought I did a lot on my trips – but they were going from Banff to Nashville and everywhere in between. Wow. My day ended with a couple more hikes once I got back to the rainforest around Sol Duc, and then a lovely soak in the hot springs. I need to get one installed in my yard… According to legend, the hot springs are the tears of a large dragon who crawled under the mountain to lick its wounds after an encounter with another dragon. Wonder if I can get that dragon to come to NY? After a leisurely breakfast, I took a last drive through the Sol Duc rainforest and headed out to Port Angeles and the Hurricane Ridge. Every single guide book I’d read had recommended visiting the ridge, so it seemed like a good place to stop on my way to Seattle. The car climbed. And it climbed. And climbed. Around me, the mountains opened up, going misty blue, and then attaining gorgeous white caps. When I finally turned the corner and entered the parking lot for the Hurricane Ridge, I was surrounded by steep white peaks that made me think I was in Switzerland! Wow! No wonder the guide books raved! Raven was there, croaking and hopping beside a snow bank. 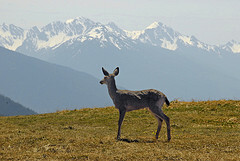 Black-tailed deer browsed the still-brown grass that had just been revealed under the melting snow. A small lodge clung picturesquely to the hillside beside the parking lot. I pulled out my camera and started shooting!! Coming down from the Hurricane Ridge was like a sharp return to real life, as I entered busy Port Angeles for some lunch. 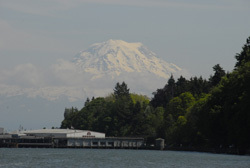 Then I drove down to Bainbridge Island and took the ferry to Seattle. That was another vista I won’t forget, though this time the height came from the Space Needle, tall buildings, and loading cranes for the massive ships in dock. And of course, from Mt. Rainier, just visible through the haze. 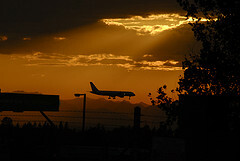 I drove through southern Seattle and located my hotel amidst a splendid sunset. Tomorrow, I would do the city justice! Seattle today. I had to try twice to get there! The first time, I followed the directions of the girl at the hotel desk. Mental note: NEVER do that again! The second time, I followed the map and my instincts, and got to Pioneer Square. Parking was a breeze, strangely enough, and I entered the square just in time to take the 11 o’clock Underground Tour. The guide was – frankly – hilarious. He had a knack for highlighting the humorous parts of history, and I laughed myself silly over the problems poor Seattle had with tides and (to be coarse) sewage. Next, we followed our guide underground, to see the various rooms and passages constructed by Seattle residents so they could conduct business while the city was raised around them. Literally raised, since soil was brought in and ground-level streets became about 15-20 feet higher than the storefronts. They put ladders on street corners so folks could climb down to the stores, browse the underground shops, and then climb back out with their goods. Once the shops were abandoned, rum runners and “sewing circles” took over the Underground. After the tour, I made my way up – literally since Seattle is built on a hillside – to Pike Place Market, where the ghost of a Native American woman can be seen walking through the halls of the lower level, carrying a basket. I saw shop keepers, tourists, bakers, fishmongers, flower sellers, Penny the pig, and just about every kind of product you could sell in the market. But no ghost. Still, it was fun. I purchased a hot apple-cinnamon bun and sat in a little park next to a huge totem pole overlooking the Puget Sound while I ate it. Then I strolled again through another section of the market, until the sheer number of people and the pushing, swelling crush as everyone fought to get through the tiny hallways overwhelmed me and I headed downtown, searching for more space and freedom. When I got back to the hotel, the first stirrings of the Pike Place ghost story were stirring through my mind, so I spent a happy evening writing another story for the book. Last day! It clouded over at last, and I got a glimpse of my first Washington rain. Which suited my gloomy mood. Everything that morning seemed to go wrong. Each direction I turned was either full of traffic, or the wrong way, or construction. When I reached the zoon in Seattle, there was not a single parking place in any of the lots, and parents with their children were flocking in from off-street parking. Obviously, something big was going on, and I fled the scene, not wanting to spend my last day in Washington stuck on long lines. Instead, I went south to a smaller wildlife park near Mt. Rainier. And happily, the rain had stopped by the time I arrived. The Northwestern Wildlife Park had just the right number of visitors to be bustling without the crowds. The tram tour through the wildlife free roaming area was a lot of fun, with moose walking right up to the windows, mountain goats playfully blocking the road, bison grazing majestically on the grassland pastures. Nice! And the animals were in naturalistic exhibits with – and this is rare – clear, unblocked access for those of a photographic turn of mind, so you can take great pictures. There were just enough free moments at each exhibit that I was able to connect with some of the animals. The Coyotes hid whenever guests came in, and came out to stare at me in wonder/alarm when I was alone in their area. The river otters chattered at me, obviously hoping I would give them food. And the sleepy raccoon woke up and came out of her hole to blink at me and sniff the afternoon breeze awhile. And the wolverine – frankly, that crazy beast posed for the camera!! It was hilarious. As soon as he saw the pop of my flash, he turned this way and that, popping his head over a fallen log, turning first to one side and then the other, and finally resting both paws on the log to look right into the lens before retiring from his impromptu photo shoot. What a ham! I drove home through the dusk and dropped off the rental car. What an enjoyable, informative, just plain fun trip I’ve had!